One of the biggest challenges in teaching the Chinese language is that we do not have a system that allows us to better understand and more accurately assess the development of our student’s literacy. The field of English language learning or even ESL has decades of research from multiple countries and multiple linguistic backgrounds about the development of English literacy. There are well established systems such as Fountas & Pinnell and Developmental Reading Assessment (DRA) that helps instructors assess students reading level, accuracy, fluency and comprehension. But for Chinese, we do not have these types of systems or research and data to support the way we work with our students. In order to make Chinese literacy more achievable for our students and enable them to become proficient readers, we need a system that allows teachers to better understand and accurately assess the student’s development of literacy in Chinese. 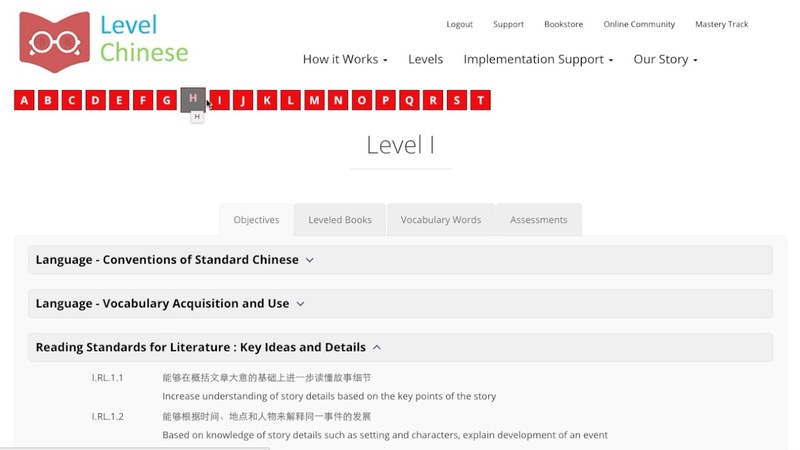 Level Chinese curriculum leverages standard framework such as Common Core and ACTFL Can Do statements and provides twenty (20) levels of reading-writing standards and mastery-based assessment with detailed analytics. 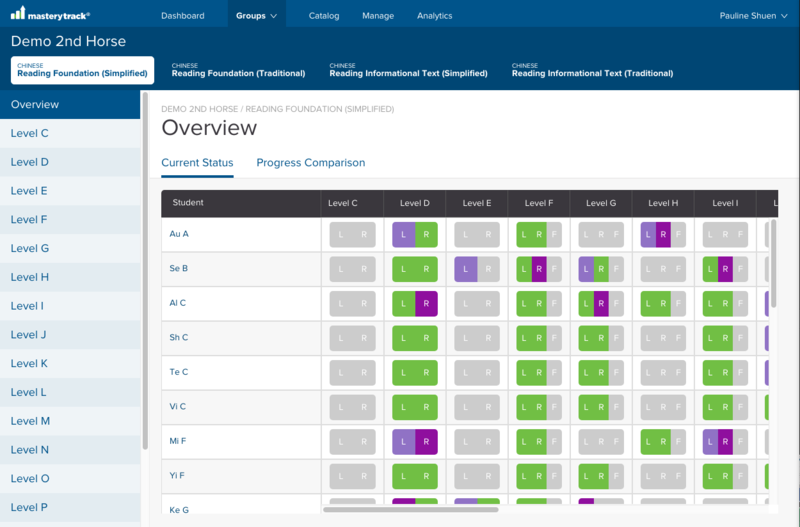 Our system helps teachers accurately assess the literary competency of each student and provides data for teachers to strategize and modify instruction based on each student’s needs. This along with access to properly leveled books and mentor texts enable teachers to differentiate instruction and promote students to be successful. Lesson Planning For Whole Class Instruction from Pauline Shuen on Vimeo. Watch video on how to plan literacy instruction. Data Driven Instruction of Chinese literacy starts with good lesson planning. Every school has its set curriculum. 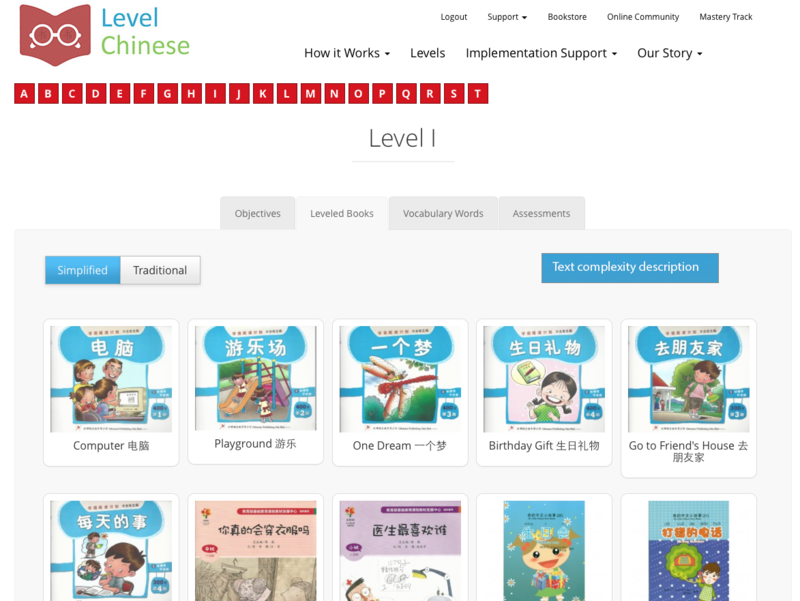 Level Chinese provides resources so that teachers can additionally focus on literacy instruction while delivering the content specified by the school’s curriculum. As you know, Chinese is a non-phonetic language. Students need to recognize many characters before they can comprehend a simple text. Even worse, when students learn one set of vocabulary in one book, they cannot easily read another book with different vocabulary. That could make learning how to read in Chinese very frustrating for our students. Our literacy instruction framework focus on transferable literacy skills. Transferable skills are grammar points and reading strategies which students can apply even when they don’t know all the characters in a book. Student can apply these skills and successfully navigate around unknown characters and achieve reading comprehension. Transferable skills allow students to read different kinds of books independently without teachers having to always sit with them. These transferable skills are called Objectives in the Level Chinese system. You can now focus on objectives from the level suitable for the specific group of students instead of the whole class. You can also use leveled books suitable for the group of students instead of one text for the whole class. Students will also enjoy reading different variety of books at their reading level. 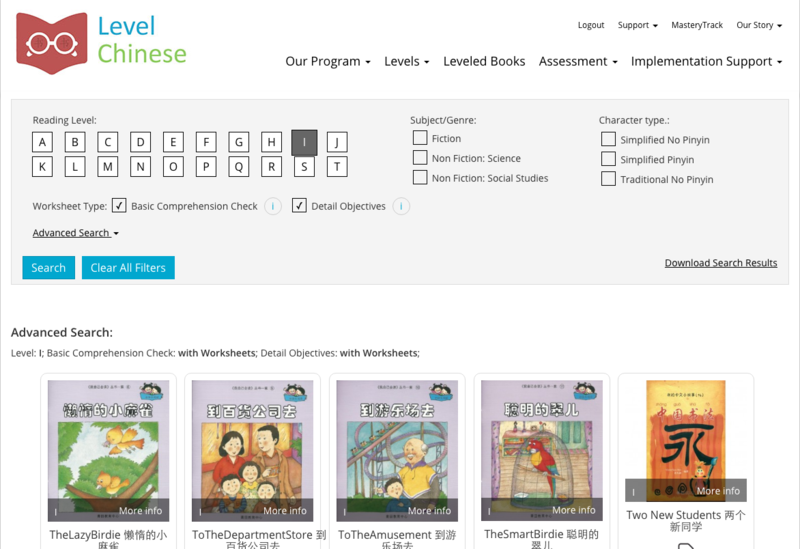 Level Chinese defined Text Complexity and leveled published books so students can read at their respective levels. Text Complexity Description for each of our twenty 20 levels for fiction and 16 levels for non-fiction leveraging standards such as Fountas and Pinnell text characteristics. Over 1000 books and passages from many different publishers across all genres (picture books, cultural stories, chapter books, biographies, informational text etc.) and formats (print, audio, online) are available in our collection. Level Chinese is now a publisher. Check out our Reach | Connect | Grow Non Fiction Leveled Book Series. Differentiated instruction lesson planning from Pauline Shuen on Vimeo. Watch video on how to plan differentiated instruction. Design of our worksheets from Pauline Shuen on Vimeo. Watch video on design of our worksheets. Once instruction takes place, students need to practice applying their literacy skills on appropriately leveled books. Level Chinese provides two types of worksheets. Watch the short video to learn the details. Both Simplified and Traditional versions are provided. Basic Comprehension worksheets – One worksheet is provided for all books in the same level. Open-ended questions targeting at students’ ability to apply the reading comprehension objectives of their respective level. All questions are written in a similar style and use similar vocabulary as our assessments. Each questions used in assessment target specific leveled objective so that both teachers and students can clearly see the skills student has mastered and those that they need to spend more time on. The assessment results can objectively reflect students’ level of Chinese language usage, comprehension and fluency. Assessments are online and automatically graded. Both Simplified and Traditional versions are provided. Introduction to our Mastery-based Assessment from Pauline Shuen on Vimeo. 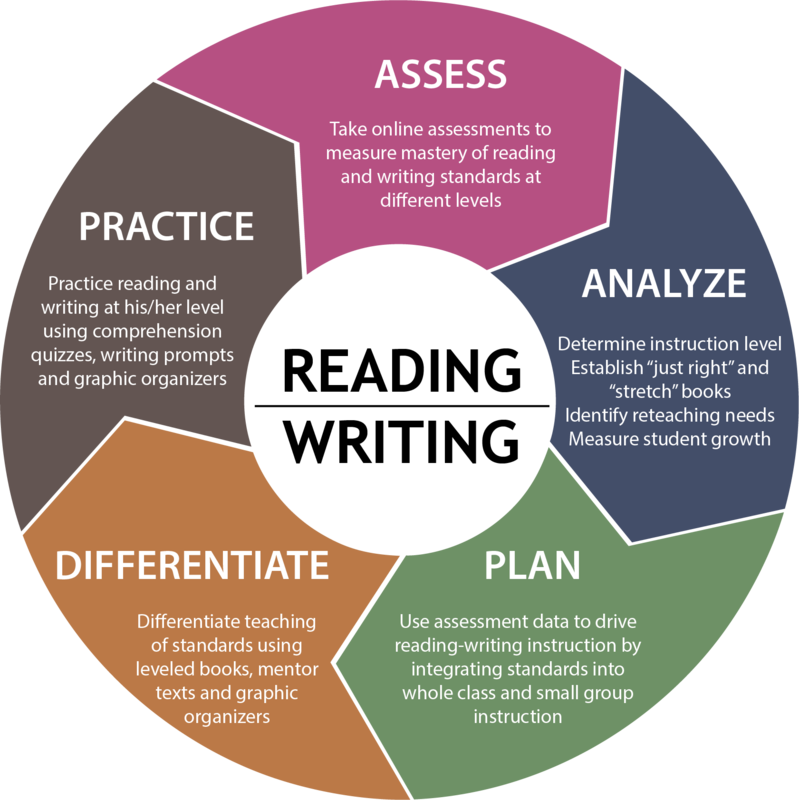 Watch this video on introduction to our assessments. Mastery-based Analytics from Pauline Shuen on Vimeo. Watch this video on introduction to our analytics. Our assessment system provides multiple ways for you to analyze assessment results. With concrete data at hand, teachers and administrators can strategize how best to help students make progress. Per Level analytics highlight which objectives need repeat instruction for the whole class, a small sub-set of the class and what intervention individual students may need. 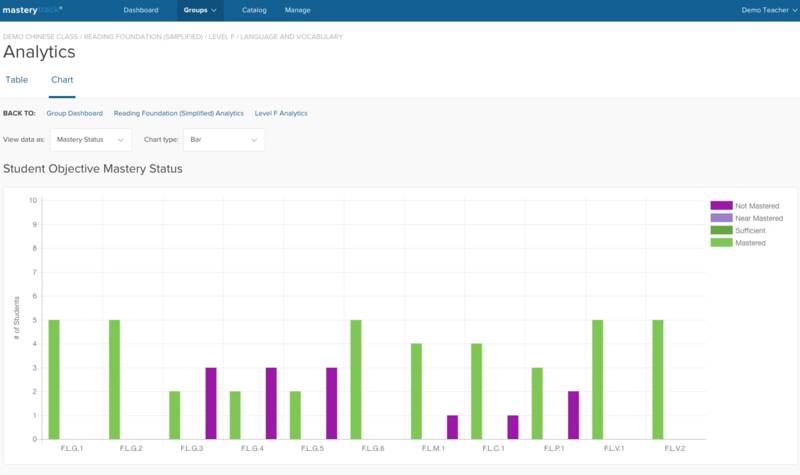 Once your students accumulate data in our assessment system for a whole school year or more, this type of analytics helps you set learning targets per grade per year for the future based on your students’ historical data.